Today is a day of many celebrations for French Fridays with Dorie. First of all, we’re celebrating Dorie Greenspan’s birthday! Next, we’re celebrating Dorie’s new book, out this month, Baking Chez Moi. And, finally, we’re celebrating four years of French Fridays as we move into the fifth and final year of cooking our way through Dorie’s book Around My French Table. All of these reasons make it a special Friday for me: I love birthdays, especially mine, but I do love anybody’s birthday. I love cookbooks, having hundreds on the shelves (and the floor, and the counters, etc.). And I love my wonderful Dorista friends and being part of French Fridays. How are we celebrating all these things? Well, we’re actually stepping outside the box for the day. Rather than making something selected from Around My French Table, we’re baking something from the new book, Baking Chez Moi, which comes out next week. There are several recipes from the book that are available on the internet, so we’re making a choice from those. I decided to try Palets de Dames, Lille Style, an iced cakey sugar cookie. 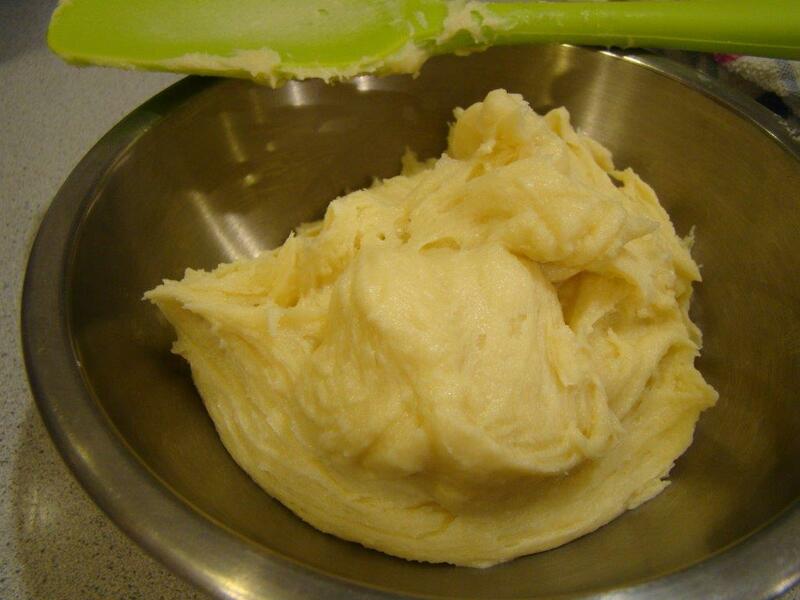 The stiff batter is mixed up in a stand mixer before chilling. 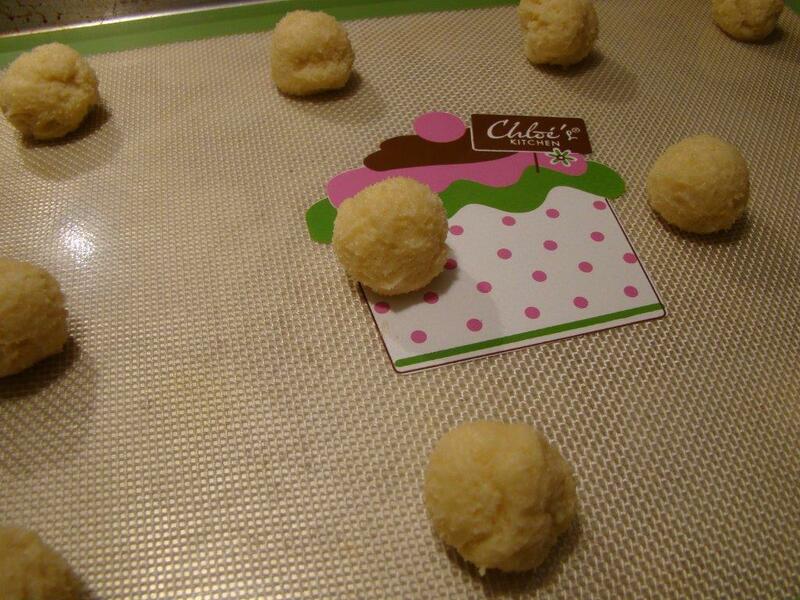 Then you shape the cookies into small balls. The cookies spread quite a bit, ending up rather flat, so be sure to space them far apart. I baked one dozen at a time on a half sheet pan. For the first tray, I used my smallest cookie scoop, but they baked up into irregular shapes. For the remaining trays, I used the cookie scoop to approximate portioning, but rolled the dough into uniform balls between my hands. Even then, the cookies in the middle spread into nice circles while the ones on the edges were more oval. I think the baked cookies gave me a map of the unevenness inside my oven. Once the cookies cooled, I mixed up the simple sugar-milk icing. I didn’t have any milk, so used heavy cream instead. I had to use at least twice the amount of liquid called for to get the icing to the right consistency, perhaps because the cream was thicker than the milk. Surprisingly, it is the flat side of the cookie, the bottom, that gets dipped into the icing, changing to the rounded top to the bottom, so they roll around a little bit on the plate. (From official photo of these cookies, it looks to me like they were done the opposite way.) 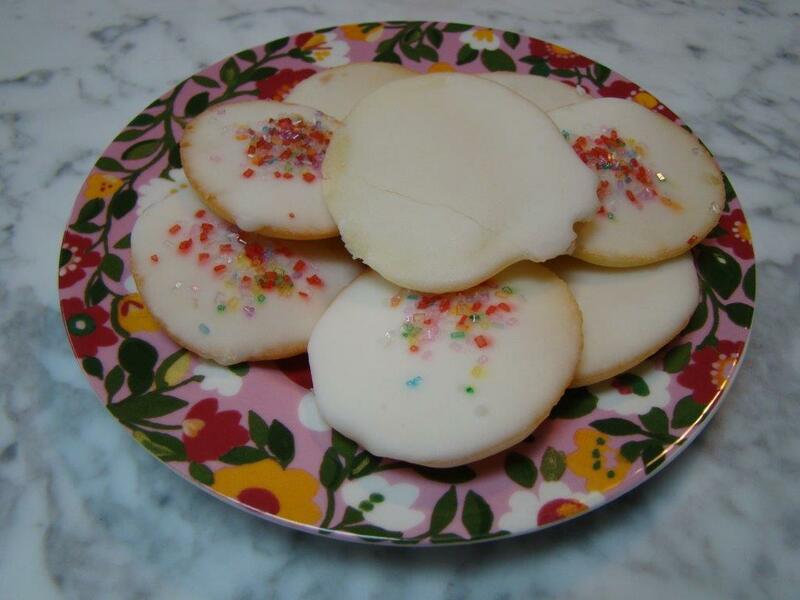 For a festive touch, I sprinkled some of the cookies with some colored sugar. While I prefer a crisper or chewier cookie, these are perfect with a celebratory cup of tea: light, not too sweet, and delicately pretty. If you’d like to try them yourself, you can find the recipe here. So, happy birthday to you, Dorie, and congratulations on your newest book! I look forward to baking more recipes from it. And to my Dorista friends, here’s to another year together. It’s been quite the unexpected ride over the past four years. To see what other delicious birthday treats were baked up this week, check out my Dorista friends below, or follow their links here. Posted on 24 October 2014, in Baking, French Fridays with Dorie and tagged birthdays, cookies, French Fridays with Dorie. Bookmark the permalink. 22 Comments. I didn’t even realize that the bottom was supposed to be dipped! We dipped the rounded top. Whoops. I thought these were great with tea, too. I totally need to make these ones – everyone who made them loved them so much and they are so cute! These would be perfect with my afternoon tea! They look so festive…perfect for Dorie’s birthday! Betsy, Congratulations on your anniversary- long term commitment to Cooking with Dorie over the years. A rather tall accomplishment. The cookies look lovely to try and it seems, as others have suggested, would be pleasant with afternoon tea. Thanks for a fun Post. Oops, I obviously wasn’t paying attention because I didn’t even notice that the bottoms were supposed to be frosted instead of the tops. Which is a nice reminder that this adventure isn’t over yet and we still have some great recipes to tackle. I love birthdays too, and happy to celebrate them. Your cookies are cute! You know, Betsy, I don’t think that Dorie meant to dip the flat side into the frosting. Although that’s the icing directions she gave in the advanced copy of Chez Moi (which you received), the directions that are on the FFWD Link actually say to frost “one”side. She obviously changed the directions for the final copy. Since she describes the cookies as a parasol or a top, it just makes sense that she wants the dome-part of the cookie frosted. Isn’t that what you think? I held the flat part of the cookie, turning it upside down and dipped the dome part of the cookie into the frosting. It seemed to work. ??????? Great looking cookies Besty! A very fun virtual birthday party for Dorie and the FFWD gang – so glad to be part of this group. Cheers to you! I couldn’t manage dipping the flat side (at least not neatly), so I dipped the dome side, instead. Yours look so pretty and festive – perfect for a celebration. I’ve loved cooking alongside everyone for the past four years and am looking forward to Baking Chez Moi and the rest of our Around My French Table Adventures. I’ve really appreciated all the work you and Mary have done since Laurie seconded you – it’s been the glue that holds our community together. Dome side, flat side….does not matter, cos my icing always goes blahhhh on me… it appears like clear glaze whenever I ‘iced’ my cookies! But I do love the colors in yours! I love celebrations in general!! Birthdays always make me smile…especially someone else’s! Your cookies look lovely, Betsy! I wish we could sit together and enjoy one or two of those cookies with our tea! BTW…the tea you brought me is marvelous! I would love to share! Hugs and happy weekend! How perfect and cheers, Betsy! Another year to cooking & baking together!! I love that the cookie gets reversed, thats fun in a whimsical way! :) For sure, we are all going to really enjoying hanging out together next time! Anniversary, looking forward to cooking/baking with you for a few more years. I love our little group on French Fridays, I just wish I had found it sooner. I know you said you are more of a cook than a baker, are you going over to TWD with the new book? I was sorry to miss out on the celebration, but I look forward to making these cookies next week for TWD!